These online pages are a virtual counterpart to a permanent exhibition at a museum in Lachine, Quebec, a great resource for those interested in Canadian brewing history. The subject is commercial advertising in the 20th century viewed through the lens of Black Horse Ale. The exhibition is called “To Get a Drink you Have to Sell – Pour Boire Il Faut Vendre“. The name is from an old French drinking song, meaning apparently one must sell off one’s butin (worldly goods) to have money to drink. The line was inspiration to the designers of the exhibition in a different sense – the consumer’s beer supply is based on effectives sales. They did a great job, both for the physical show (which I’ve attended) and this online version. In many ways, the virtual iteration is superior since hundreds of documents and objects can be magnified and easily viewed, provided (in many cases though) you read French. Black Horse Ale was a top-selling brand of Dawes Brewery, founded early in the 1800s in the Montreal suburb of Lachine, Quebec by an English immigrant. It grew out of farming operations conducted by the founder and his progeny continued the business through the 19th century with increasing success. 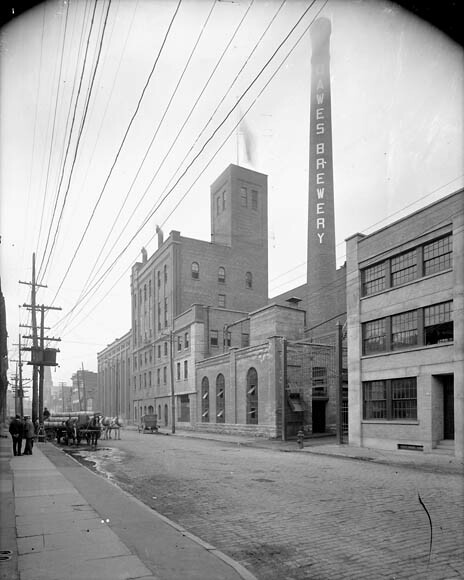 Not long before WW I more than a dozen Montreal breweries, including Dawes, merged to form National Breweries Ltd., a typical combine of the era. It was formed to compete against Molson Breweries, in particular. Molson had been invited to join the cabal but declined. Molson had the last laugh though: it bought out National Brewery’s successor in 1989. In 1952 National Breweries had been bought out by Ontario industrialist E.P. Taylor’s growing leviathan of breweries, but before that it functioned for some 40 years with a core of five breweries. – Boswell’s Brewery in Quebec City, founded on the site of a brewery established in the 1600s by Jean Talon, the Intendant of Quebec sent by the French king. In the late 1940s a sixth was added to the group, Champlain Brewery in Quebec City, well-known for its Champlain Porter. The porter was still being sold by National’s successor, Carling O’Keefe, in the 1970s in Quebec, it was sweet and licorice-tasting. Champlain Brewery too, I should add, had been francophone-owned. A review of the employees’ magazines made available in the virtual exhibition reveals that each plant ran fairly autonomously. Of course there was central purchasing of malt and hops and other inputs, but each plant had its brands and, if I read the exhibition right, each brand had its own yeast, a single-cell type. The magazines reflect a decorous quality we have lost since those times. One plant would host visiting personnel of another, and the plants would engage in sports and other social activities as a unit. When any plant acquired new trucks or brewing equipment, this was proudly described in the magazine. Some people worked for these units for decades, one retired in the mid-1940s who had started in 1898. Reading the magazines gives a real sense how the “family” functioned. The personnel had a mix of English and French names with the odd European one appearing. The magazine came out in English and French but almost all those currently online (over 80 of them) are in French, as are many of the advertising objects and other materials. Some of these objects are in English though and, crucially to students of brewing history, two detailed brewing recipes appear. One is for Dawes’ Kingsbeer Export Lager, the other for a draught special ale, both from the 1930s. Probably the draft ale was sent to the taverns and bars of Quebec Province. There are numerous interesting black and white photographs of some of the taverns. The interiors look very similar to taverns as I recall them in Montreal in the 1970s. The brewing recipes are very detailed, in a format I have not seen before. Notable points include all-malt production for Kingsbeer and use of all-Bohemian (Czech) hops. There is even a taste-note: the beer smelled and tasted “mildly hoppy”. I hope so, by my reckoning it used 3/4 lb hops per barrel of finished beer – that’s a lot by today’s standards even for craft beer. The draught ale also was all-malt and used even more hops, just under 1 lb per barrel. At various periods, according to the magazines, English, Californian, and Canadian hops were used in the group’s beers. During the war it just North American though. Hops up to three years age were stored and blended with newer hops for production. The Kingsbeer brand, which I always thought had a British connotation, was originally called Konigsbeer and dates from before 1914; it probably was a Dortmund-style due to the descriptor “export”. In the mid-40s the Dawes line was Dawes Black Horse Ale, which seems a derivative of IPA; Dawes Export Ale, probably a newer (post-1900) lager-ale hybrid; Kingsbeer Lager; and Dawes’ Porter. Filled bottles still exist of some of these and can be viewed in the virtual exhibition. There are great photos of the different plants in the group and of a pilot brewery at Dawes in Montreal in 1943 which calls to mind a modern craft brewery. I didn’t see much discussion of beer characteristics in the magazines. Mostly they deal with employee matters: bowling tournaments with Boswell’s in Quebec City (they played to win a turkey), marriages and retirements, congratulations on a new birth. (“It’s a boy – good work Jim!”). There is lots in the early 1940s issues on the war effort. One of the Dawes family had been wounded fighting in Europe but apparently recovered. Bond drives, blood donations, sending beer and cigarettes to the troops: lots of course on those subjects. One magazine, though, describes beer production at Boswell’s in Quebec City. Boswell later became the Dow plant in Quebec that made the fateful beer in the 1960s that probably caused the death of heavy drinkers in the city; I wrote about this earlier here. The two beer recipes, running three or four pages each, are at the bottom of this link. Note re image above: the image was sourced from this Canadian government archive collection and is believed in the public domain. All feedback solicited. What, if any, is the relation to the Black Horse beer I grew up with in Newfoundland? Similar label…but always thought to be indigenous. Gary, it’s not indigenous, the brand came from Dow when Canadian Breweries Ltd. (E.P. Taylor) bought Bennett Brewing in Nfld in 1962, Bennett had made Dominion Ale and the Haig brands. See the information discussed here http://nlbeerhistory.com/newfoundland-beer/. In that link, the writer links to another post where he discusses that (apparently) Black Horse Ale became a lager in the 70s. But clearly the brand, when it first came to the Island, came from Dow/Canadian Breweries/Dawes, i.e., CBL got it when it bought National Breweries Ltd. in 1952. It gets complicated because in fact there was a Black Horse Ale in the U.S. with a different parentage, but that’s a different story.